Review: Fourth Time's the Charm for "Mission: Impossible - Ghost Protocol"
"Mission: Impossible - Ghost Protocol" actually does the impossible: It's the best of the whole Tom Cruise franchise so far. Injecting some unexpected but welcome summer movie adrenaline into a holiday season that was threatening to get swallowed up by Scandinavian angst, director Brad Bird and star Tom Cruise have finally figured out how to make "Mission: Impossible" tick. And it's by finally having some fun. The "M:I" franchise, despite its A-list talent and huge budgets, has always been oddly forgettable and lacking in personality (Quick, recap the plot of "MI3." Exactly). "Mission: Impossible - Ghost Protocol" drops the self-seriousness, streamlines the plot, and focuses on delivering a good time. And it does. "Ghost Protocol" is the first "M:I" film that doesn't seem to be deliberately trying to lose you. The double- and triple-crosses and credibility-straining disguises are toned down, and the audience can finally follow every character's objective and understand what's at stake in every scene, which gives the action some thematic and emotional weight. And that is a very good thing, because Bird has crafted some astounding action set pieces. There's a funny and tense Kremlin infiltration, an elaborate game of "keep-away" on moving platforms inside an automated car park, and, of course, the entire Dubai sequence-- yes, the one where Cruise scales the world's tallest building. If you have to cross state lines to find an IMAX theater, DO IT for this sequence alone. Not only breathtaking (do you know how hard it is to make jaded audiences gasp these days? ), it reminds you that no amount of green screen or digital enhancement can beat dangling your star hundreds of feet above concrete and swinging him around like a tether ball. 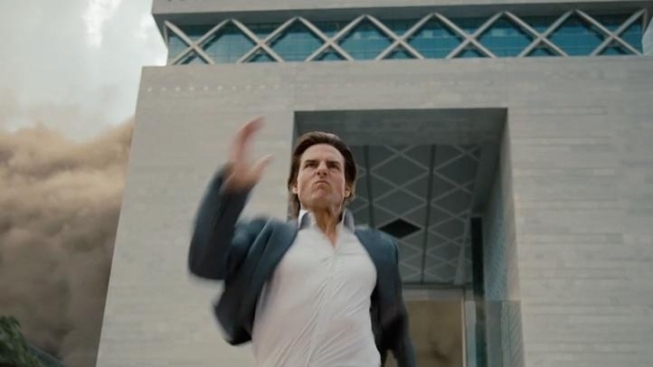 Kudos to Bird who, as an animator (he did Pixar's "The Incredibles"), could have played it safe, and extra special kudos to Cruise for being, well, Tom Cruise enough to even attempt the stunts. This is not to say that all of the nagging "M:I" problems are solved. Despite Cruise's commitment, Ethan Hunt remains the dullest character to ever have a major franchise built around him. He's good at what he does and….that's about it. He has no other discernible personality. However, this time around, they were smart enough to surround him with a crew that, for the first time, doesn't feel disposable. Simon Pegg reprises his "MI3" computer geek role, but seems much more comfortable with it. Paula Patton surprises by out-badassing Cruise, and "Ghost Protocol" is just another in a series of films that prove Jeremy Renner can have chemistry with a brick wall (It really has us counting the days until "The Avengers"). We finally get an IMF crew we care enough about to root for, and it even rubs off on Hunt - Cruise gives him moments of humanity that offset his machine-like expertise. He's not exactly thrilled about having to scale the Burj Khalifa, and he's not afraid to show it. "Mission: Impossible - Ghost Protocol" is a blast that, oddly, reinvigorates a franchise at a point where most have one foot in the grave. Who would have thought the best summer movie of 2011 would come out at Christmas? "Mission: Impossible - Ghost Protocol" opens in IMAX only on December 16th, then in all theaters December 23rd.